There are two kinds of ‘predictability’ you come across when you’re watching a film. The first, more commonly occurring type, is when you absolutely know where the story is headed, because the writer and director had no imagination while scripting and making the film; the ‘yawn’ kind of the predictability. The second, which is so rare, particularly in our films, is when your characters are so well etched out that there is really no other step the person would have taken when faced with a particular situation. It doesn’t jar; it just feels, for want of a better word, natural. I was pleasantly surprised, then, when Anjali Menon’s Bangalore Days had a lot of the second kind of predictability. Now if you look at the run-time of the film - just a shade under 3 hours – you wonder why a film that is about young people and by inference, targeted primarily at young people, would be so long. (We’ve reached a stage where not many have that kind of an attention span, and most films hover around the 2 – 2.5 hour mark.) The answer, again, lies in the characterization. The characters are given room to breathe, explore and discover themselves. Bangalore Days, thus, surprised me on multiple levels. The three main characters, Arjun, Divya and Krishnan (fondly called Kuttetan), are cousins. Extremely close to each other while growing up in Kerala, they always promised each other that they’d go to Bangalore when they were older. As it turns out, their life takes them exactly there; and their journey is something truly worth sharing. Handled with a surprising amount of patience and maturity, we get involved in each of their stories equally. Newly-married Divya’s problems with a reticent husband – the fourth important character in the film; Kuttetan’s yearning for a simple, Malayali girl who’ll make him happy; and the nomad Arjun’s journey towards internal stability; each of these tales could have been a story in itself. Put together, though, it makes for a soul-stirring ride. Because not only is each of the characters written well, but their relationships with each other have also been crafted with love. They stand by each other, fight, make up and pull each other along beautifully. Yes, the film has its share of ‘twists’ that seem a tad out of place. But one way to look at them is to find out how our primary characters will deal with them. So what eventually make the twists work is the fact that they tie in with the lives of the characters beautifully. The film is also about little moments, little deft touches which add a wonderful texture to the story. I don’t want to give anything away, but these little moments show that a lot of thought went into putting the film down on paper. Insight into human behaviour and relationships, a love for the little flourishes of life, and genuine fondness and affection for the characters being written. Yes, some of these moments would be classified as ‘filmy’; but they all have one origin – the writer-director’s heart. The icing, then, is the cast. 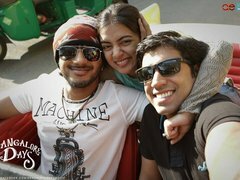 Cute-as-a-button Nazriya as Divya charms you. The fact that her husband, known through most of the film as Das, is played by her wonderfully talented real life fiancé Fahadh Faasil, gives their story that added zing. Nivin Pauly as Kuttetan has a sweet, bumbling presence. And young Dulquer Salman, who plays Arjun, is a star. The screen presence and confidence is in his genes, of course, but he’s also a solid actor – a talent that cannot be taken for granted even if your father is Mammootty. Bangalore Days is one of the most honest films I’ve seen in a while. The effort put into the film manifests itself in ways that can’t strictly be quantified. The film is well shot as well, and has some really nice music. Bangalore, a city that I personally love, is also beautifully captured in the film. It seems so long since we’ve met characters who we fall in love with and walk with while they fall in love themselves. Bangalore Days offers you just that.